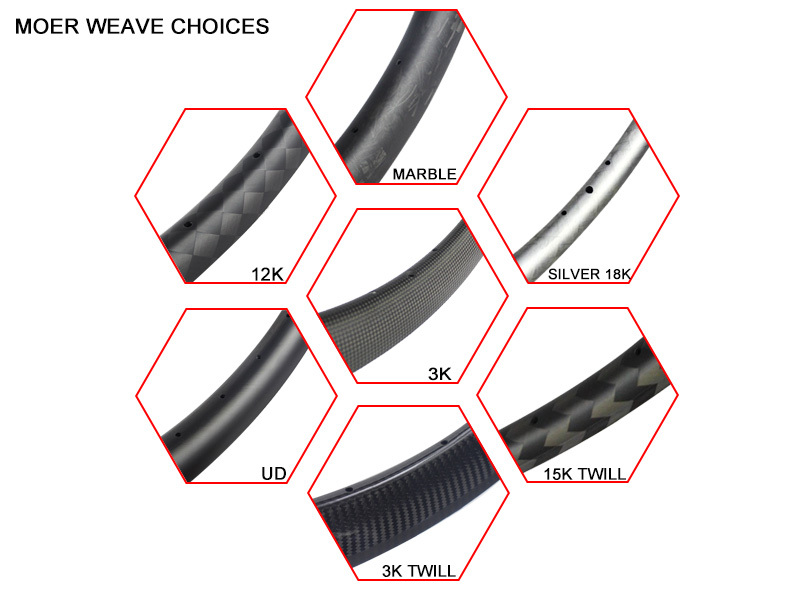 In addition to UD, 3K and 12K weave, BTLOS offers more choice of weave for carbon bicycle rims! Here you will find your favorite appearance. What is the difference between weaves UD, 3K, 12K, 15k, 3K twill, 18K, 15K twill, marble and silver 18K? All the fibers are parallel so no weave pattern visible. Unidirectional carbon fiber is comprised of bundles (tows) of carbon filaments all oriented in the same direction. There is no apparent weave to this style of fabric. Twill weave looks just like a wicker basket. This weave is slightly more complex than bidirectional because two tows in each direction are woven in a two-over, one-over, and one-under fashion. The resulting pattern creates a sawtooth diagonal pattern across the fabric. The twill weave offers greater conformability, presents a beautiful herringbone texture, and delivers a slight edge in strength. The 3k, 12k, 15k and 18k are types of weave. The number refers to the number of fibers in each tow of the weave (3000, 12000, 15000, 18000). Carbon fiber is measured by the width of the weave. For instance, a 3K weave will be approximate 3mm in width while a 12K weave will be much larger at approximately 12mm and so forth. This kind of appearance treatment only achieves the beautiful effect and does not have any practical effect on the material strength and the like. Different weaves can either give varying amounts of strength and looks. The rim strength and weight are almost the same. The 3k / 12k / UD / 15k / 18K / 3k twill / 15k twill / silver 18k/ Marble is the choice of cosmetic appearance. In short, just choose what you like. When ordering, if you need an appearance other than UD / 3K / 12K, you can email us directly or contact us online.